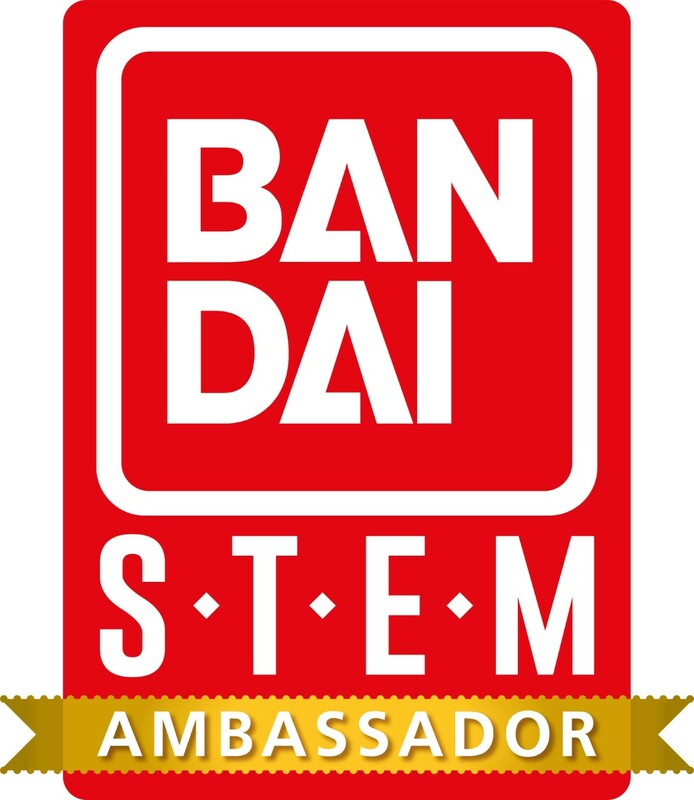 You may have spotted last month that we were very excited to have been announced as Bandai STEM Ambassadors, which means over the next 6 months we get to share with you lots of fantastic STEM toys and products! 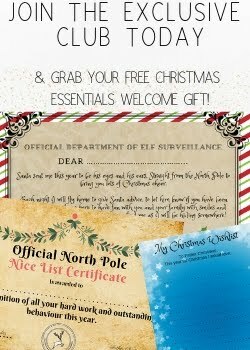 Did you spot our review of the National Geographic STEM dig kits? Well this month I have another exciting National Geographic kit to share with you, this month it is the Breaking Open 2 Geodes kit. 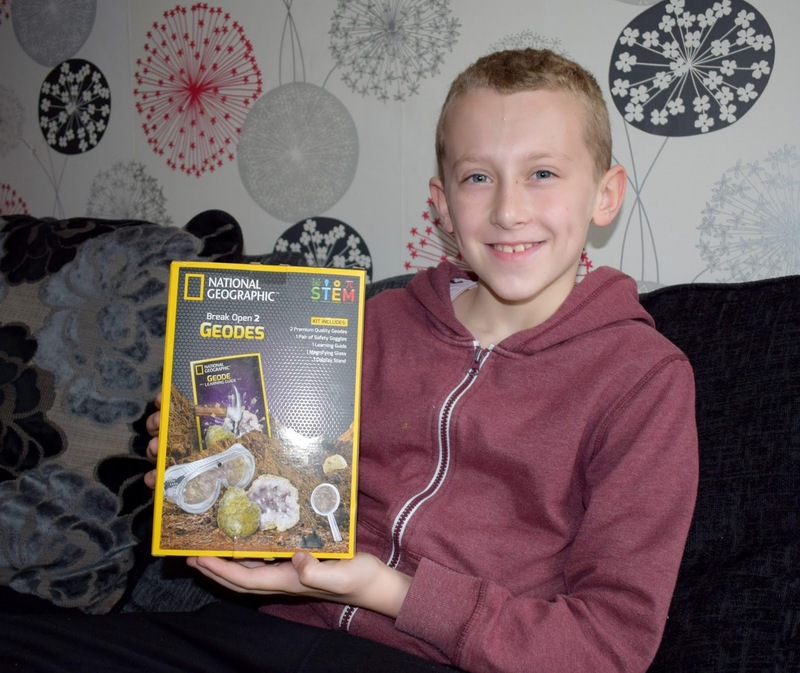 This fantastic kit gives kids the chance to break open two of their very own Geodes! The National Geographic Break Open 2 Geodes set contains everything you need to break open two of your very own Geodes including two high-quality crystal filled geodes, safety goggles, display stand, and full-colour learning guide. All you will need to provide from home is a hammer and a chisel if you choose to use one. 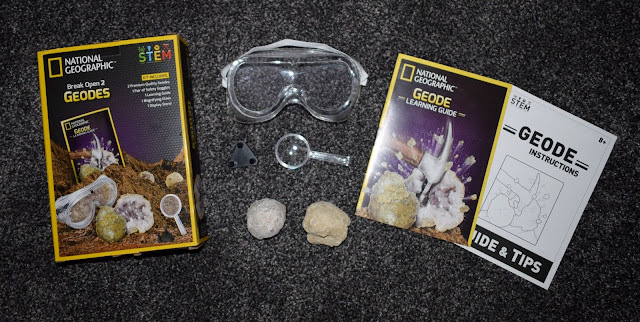 The kit contains two different types of Geodes to discover and the handy leaflets that come with the kit are packed full of useful information and images to help you identify your geodes once you break them open. There are several ways in which you can open your geodes depending on how careful you want to be and if you want to try and achieve two clean halves or don't mind several smaller pieces instead. 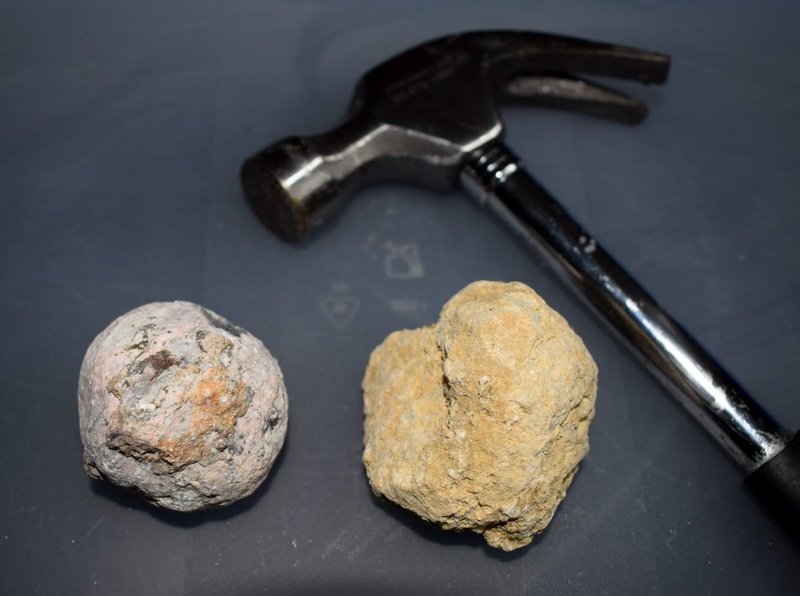 If you aren't too worried about your geode breaking into many pieces you can just hit it with a hammer, I would advise placing your geode into a sock or small plastic bag if breaking open your geode this way. That's because it can break into quite a few pieces and this will keep them all contained when your geode does break. Alternatively if you want to try and achieve two cleaner halves like James did, the kit suggests using a chisel and hammer, gently tapping the chisel with the hammer around the centre of the rock and continuing this until you see your geode begin to crack, this method does of course take much longer. James was so excited to try this kit (and so was I!) I have seen geodes before but never actually opened one myself and me and James were both intrigued to find out which crystals might lay within our geode. We received two different geodes in our kit as shown above and its safe to say both were pretty tough to get into too! However the more yellow/sand coloured rock was definitely much easier than the other. We couldn't find a small enough chisel so instead used an old flat head screwdriver which seemingly worked fairly well. James gentle chiselled around the entire outside with gentle taps, once he had done this one he began to go back around, hammering slightly harder this time. James is 9 and was completely engaged in this activity, he absolutely loved the excitement and even though it took us a little longer than expected to open them both up he never once lost interest. The only thing he needed help with was to hold the geode in place as he hammered and chiselled it. 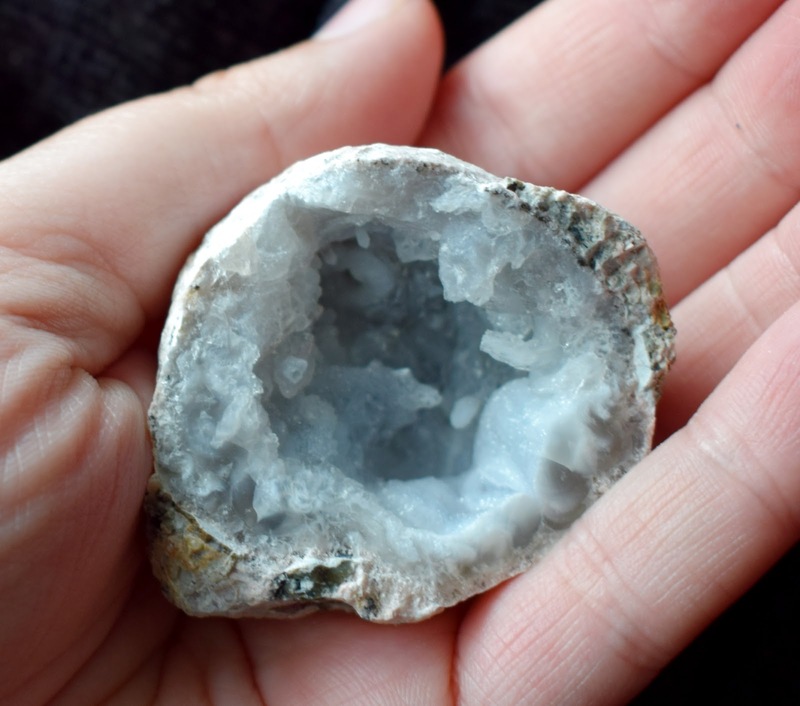 Inside our first geode we found a beautiful white/translucent crystal with an almost pink/grey tint to it. Once we had cracked open our geode is was fascinating to see how the crystal had formed inside and how beautiful it was hiding inside what looked like an ordinary rock from the outside. Our second geode was much more tricky to get in to. It was almost perfectly round which made holding it still to chisel around really tricky but not just that, it just felt much harder to get through. I actually think it took us around 40 minutes of gentle hammering (and maybe a little bit of heavy handed hammering towards the end!) to finally break into our second geode. Our hard efforts were rewarded though with an absolutely beautiful almost cloud like crystal formation coating the inside of our geode. 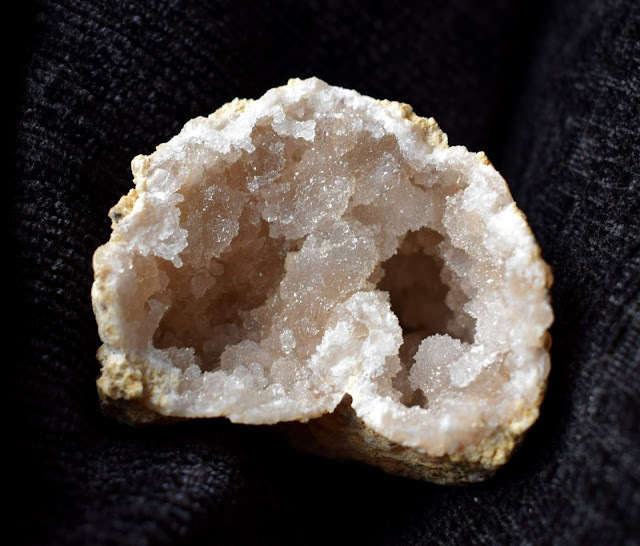 Unlike our previous geode where the crystal felt quite sharp and jagged, this crystal felt smooth and had only really formed around the outside of the rock making the centre completely hollow. 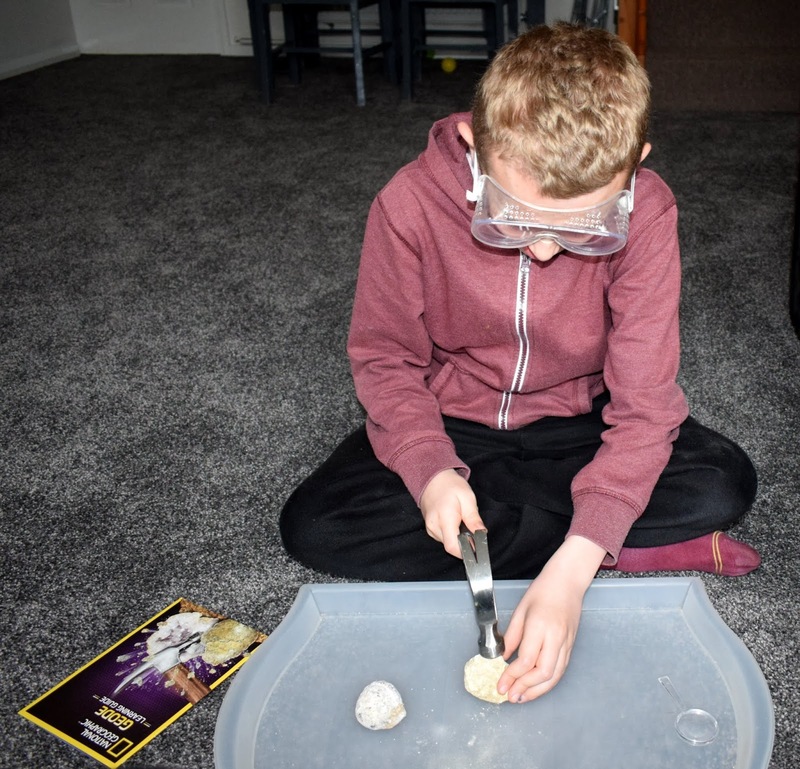 National Geographic Break Open 2 Geodes kit has been a huge success in our house, James absolutely loved breaking open his very own geodes to keep and even Evelyn got involved having a go with the hammer with lots of supervision. The booklets such as the learning guide that come with the kit are a great addition too since James was so fascinated by geodes once he had cracked open his own. The booklets and guides gave him lots of information and answered lots of his questions such as how geodes are formed etc. We give this kit a big thumbs up and James proudly has his new geodes on display in his bedroom window, when the sun catches them they really do glisten too. The kit is aimed at children aged 8+ and is priced at £9.99 which includes your two genuine geodes. It would make a great gift for any little ones interested in geology especially.